Fluoride was used during the Second World War in the concentration camps in Germany. It was found that this chemical increased compliance and in general, made prisoners docile. Today, there are Western countries who have fluoride in their water in some areas, so it is worth taking the time to have a look at some of the below links so you can do your own research and make your own findings. Research, clink on HYDROFLUOSILICIC ACID picture to enlarge. As of 2015, there have been a total of 52 human studies to determine the link between fluoride and Intelligence levels (IQ). In a whopping 45 of these studies, the outcome has been that exposure to fluoride reduces IQ and can impair memory capacity and learning. These studies in total have included 11000 children which clearly show that exposure in early years can damage the developing brain. 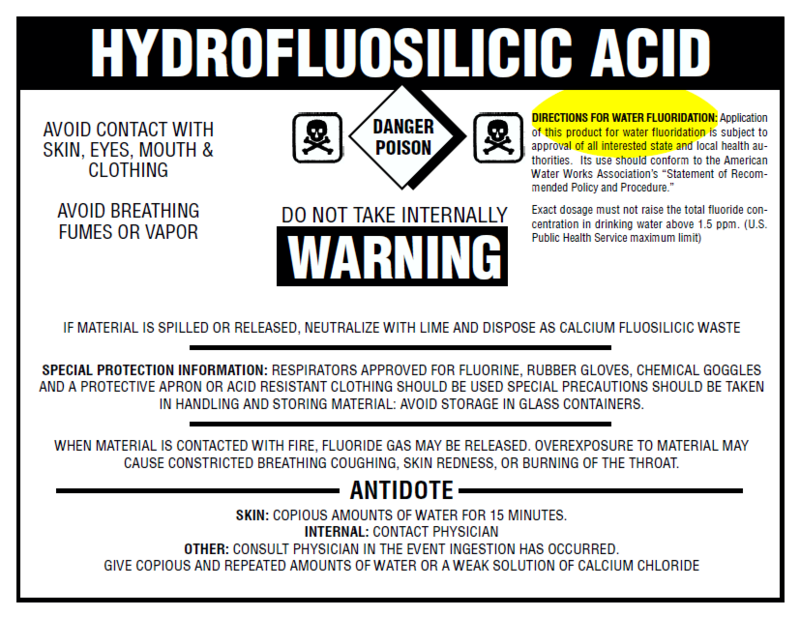 Humans have long known that fluoride is toxic and it is why we use it in many pesticides and why organizations like the Food & Drug Administration (FDA) require poison warnings to be labeled on toothpaste that contains fluoride. In the 50s, it was believed that fluoride was a nutrient needed for good health. The case was made by dentists that children needed to ingest it in order to develop healthy teeth, in a similar way a deficiency in vitamin C can cause scurvy. It is a false theory and it bears little difference on whether your teeth will develop cavities or not. More recent research has shown that topical application of fluoride can be of benefit to teeth, however even if you agree with this research the reasoning to put fluoride in communities drinking water is now invalid. Dental Fluorosis (pictured right) is by far a more common issue which will occur with ingesting fluoride rather than prevention of tooth decay. In fact, it is even more alarming when you consider how much toothpaste children ingest due to the sweetening of children's toothpaste in a bid to ensure they brush their teeth twice a day. If your local area fluoridises the drinking water, here are some ideas to ensure your family is protected. Did Hitler really put fluoride in the water at concentration camps? If so why do we put it in our water? Researched completed meta-analysis of 27 studies on the effects of fluoride on IQ. Results showed that children in high fluoride areas had significantly lower IQ scores in comparison to children in low to no fluoride areas. The following video is an in-depth presentation by Professor Paul Connett, the world's leading authority on fluoride toxicity. Mainstream news articles even tell you how bad Fluoride really is for you.